Ahlen, March 2015. – At the ISH 2015 premium manufacturer Kaldewei is set to present a sensation in bathing culture: Kaldewei Skin Touch offers an exhilarating cosmetic bathing experience with a rejuvenating effect. 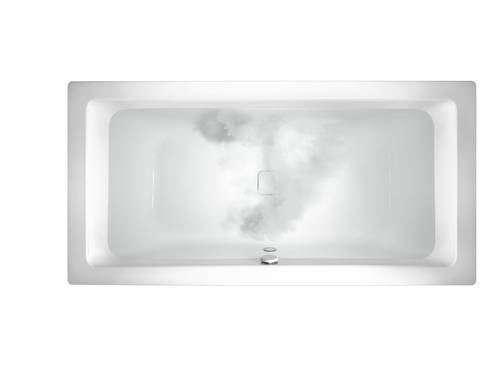 A world first for baths made of steel enamel, its invigorating action leaves the skin visibly smoother and silky soft. The bathroom has long established itself as a wellness oasis – in the hotel, but also in the home. The bath especially is synonymous with relaxation and regeneration. As the first manufacturer worldwide, Kaldewei now offers a system for its baths made of superior steel enamel which transforms bathing into the ultimate experience of relaxation with a cosmetic effect on the skin: Skin Touch uniquely combines supreme relaxation with luxurious deep treatment. Micro fine air bubbles stimulate the skin cells. Thanks to the natural power of the oxygen in the water, Kaldewei Skin Touch acts as a fountain of youth leaving the skin to feel softer and smoother after bathing. The result is skin that is silky soft and younger looking long after the bath. For the revolutionary beauty effect Kaldewei Skin Touch releases micro sized air bubbles into the water that are up to 100 times smaller than the bubbles of a conventional whirl system. The stream of air reminds of luxurious bath milk that disperses evenly in the water leaving the skin to feel silky soft and smooth even without bath additives. Bathing luxury now enters a new dimension – bathing with spa factor. For more information on Skin Touch and on other new Kaldewei products go to http://newproducts.kaldewei.co.uk/en/skintouch.html. Kaldewei Skin Touch offers luxurious bathing enriched by an altogether new dimension of deep relaxation and nourishing care: Micro fine air bubbles invigorate the skin cells with the natural power of oxygen for an exhilarating ‘fountain of youth’ effect. The skin feels noticeably softer and smoother.